Personal Finance 10 Edition Your journey to financial freedom starts here! 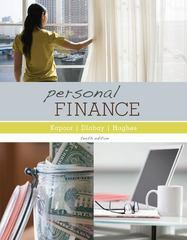 Kapoor/Dlabay/Hughes’ market-leading Personal Finance provides practical guidance on how students can achieve peace of mind with regard to their financial situation. It provides many financial planning tools using a step-by-step approach to help students identify and evaluate choices as well as understand the consequences of decisions in terms of opportunity costs. Managing money in order to obtain freedom from financial worries – that’s what the 10th edition of Personal Finance is all about!